"For the daring and adventurous, there are many lost cities to explore. They are in the Himalayas, the ever-shifting sands of the desert, the Brazilian rain forest, ancient volcanoes and in Neptune’s Realm. With limited resources the players must choose which expeditions to begin. Those with high confidence may want to up the stakes: increasing the rewards for success, but risking more should the expedition fail. The player who finds the right balance will find victory!" click above image to see more images of the game. Occasionally I get asked why I don’t write more negative reviews, I guess the answer I should have been giving was that I hadn’t had a chance to play Lost Cities. Since I do a fair amount of 2 player gaming with the Mrs I figured why not pick up this “classic” renown as a “couples game” or just a generally fantastic game for 2 players I thought what could possibly go wrong. Now don’t get me wrong, this will not be an entirely “negative review” because I do see the attraction, I mean playing the game is pretty fun, you have to make some tough choices and the mechanics are good, even your goal seems feasible, so where does Lost Cities go wrong? I can share the sour taste in my mouth by quoting one sentence from the rule book “Thus, an expedition’s value is between -80 and 156.” In a round, you can have up to 5 expeditions and you must find the total value, rarely do you actually have 5 but you can see how scoring can be a little hard to keep track of. My main issue is that the scoring feels like it is too much work for the actual game you just played, even if you do it quickly with a calculator or pad of paper it is still a chore. To have the highest total expedition value when the draw deck runs out of cards. Shuffle the deck and deal each player 8 cards. You have 2 options on your turn, discard or play an expedition card, after either action you must draw a new card. You simply place an expedition card of a higher value than the current expedition card on your side of the board where the corresponding expedition is located. You may never go back and add a lower value card, and Investment cards must be played before any numerical expedition cards have been placed. Each Expedition has it’s own discard pile, when you discard a card simply place it in the matching discard pile on top of any previously discarded cards..
You have two choices, technically 6 choices as to where you can draw your card from. You can draw from the draw deck or the top card of any expedition’s discard pile. Keep in mind that drawing from the draw deck causes the game to move closer to its end. This is where you need to get some scrap paper, a calculator and a Tylenol or two because ***** about to get intense. Note: Expeditions that do not have any cards in them at the end of the game count for 0 points, they do not get the -20. I thought it was important to mention that the artwork on the cards is really cool. The numbers show an expedition in sequential order and each of the Investment cards feature the same people in front of a different ma. I felt that the artwork was very connected to the game thought they picked a good set of colours for the cards. Why Didn’t I enjoy Lost Cities? As I mentioned above mostly the scoring, I felt that the game played good to okay but it wasn’t “fun” for lack of a better word. I think my problem is it reminds me too much of standard card games, not to say that I don’t enjoy Crazy Eights but when they start to get too serious I would rather play something with a board and bits. Who Would Enjoy Lost Cities? Casual Gamers: I do think some casuals will find love in Lost Cities, I think if you enjoy standard playing card games then you will really enjoy Lost Cities, if you do not, and consider yourself a casual gamer I would make sure to physically try this one before buying regardless of how great you think it sounds / looks. Gamer Gamers: If you are considered an “alpha gamer” or any synonym for the term then I think you will find enjoyment in Lost Cities, unless of course you do not enjoy number crunching. There is lots of deep decision making and lots of replay value. When two people who are experienced with the game play it is totally different and way more intense, a game of wits, these are why I would recommend Lost Cities to a serious gamer. During the first couple of turns you have to make big decisions that can greatly affect how your round goes. For example, do you risk playing a point card rather than waiting for the investment cards that can multiply your points at the end. Do you play a couple investment cards, even if you don’t have any other cards for that expedition? Do you discard a high value card, and risk your opponent taking it? During the game you’re allowed to count how many cards are left in the draw deck, so you know when the round is going to end. Draw cards from the board instead of the deck if you need more time to lay your cards down. Or if you see your opponent a few turns away from completing an expedition, you can try to end the game early by drawing from the deck. Buy it if … Your looking for a quick to learn 2-player game that is fun to pull out every once in a while, and portable enough to bring on a trip. Don’t buy it if … You want more depth in the treasure hunting aspect. It’s well produced, but in the end it’s a numbers game. Basic Idea: You’re an explorer trying to get backing and trying to get your expedition as far as possible, but your arch nemesis keeps getting in your way. Gameplay: Lost Cities is super easy and fun to play. It’s a two player game(though there are rules for four, but you need two sets)where you and your opponent try and lay down cards of the same suit in as close to consecutive order as you can get. On your turn you play one card and draw one card. You can play a card by putting it in front of you as part of an expedition or discarding it. You can then draw a card from either the draw pile or the discard piles. There are 5 different expeditions (colors/suits) and each expedition has 3 investment cards and 9 cards numbered 2-10. At the end of the game each expedition without at least 20 points (the numbered cards added up) is a failed expedition and you’ll lose points. An investment card must be laid down before any expedition cards and if the expedition is successful then you score multiplies. If it fails, you lose even more points. The game is over when the last card is drawn. Overview: I really like this game. It’s fun and fast (very fast) and easy to learn. The theme has nothing to do with the game and if playing cards had 5 suits you could just use them. This really feels like a game you would want to keep out for when you and your significant other are waiting for a show to start or for rice to cook. Something quick to pass the time that doesn’t take too much thought. I wouldn’t list it as an all time favorite, but it’s definitely a gaming staple. Lost Cities is about as easy to learn and simple to play as it gets. Even so, it provides significant replay value through the application of a couple of twists on traditional card gameplay that makes this one difficult to master. Both players share a central game board with five discard piles, one for each colored card “suit” in the deck. Each colored “suit” consists of a run of cards from 2 through 9 and three “investment” cards. Simply build runs of numbers on your side of the board (much like solitaire). Because numbers must be played in order (i./e., you can’t play a “5” after you’ve already played an “8”), and you can only hold eight cards in your hand, each player is forced to use the shared game board as “temporary storage” for excess cards. This results in fierce battles between the players, each one strategizing about which suit to go for and when to begin drawing from the shared discard piles. Be careful! If a run of cards in a single “suit” doesn’t add up to 20 points or more, you’ll be penalized. Were you bold enough to play a few investment cards at the beginning (and only the beginning) of your run? Great! Your points are multiplied. However, if you don’t make it to 20 points, an investment card will multiple your penality! Confounding all of this is the fact that each player must first play a card, then draw a card. This simple reversal of the standard card game mechanic provides a nice added challenge to the gameplay. A great little 2-player game perfect for a quick pickup match or two. Played it for the first time last night with someone who is not much of a gamer. They much prefer games like Uno, or Cards Against Humanity, simple or funny. Myself, I’m more about planning, scheming, trying hard to win. And that gave me absolutely no edge in this compared to her luck at drawing cards. One of the best parts about this game is as much strategy as you try to impose upon it, it will almost always come down to luck. One player will have better cards, or be able to use all your discards, or have some way to gain an edge. That having been said, I still really enjoyed it, and loved that it was designed for two. Very few games are optimal, or even playable, with two people. It was also quite quick, and you can play as many or as few rounds as you choose. The game is fairly simple, there are 5 locations, you can start an expedition in any of them. Your expedition cards have to be ascending, but do not have to be consecutive (e.g. 2,4,9 is ok, 2,5,3 is not). You can also play an investment card(s), which multiplies your success or failure, before you lay any expedition cards. Each time you play, you draw. Instead of playing, you can discard a card, which goes into that expeditions discard pile. After discarding, you draw a new card as if you played a card. Scoring is fairly simple, but I prefer to describe it as such: you want as many points as possible in an expedition, with a minimum of twenty. Should you end up with less than twenty, you lose that many points, and if you have more than twenty, you gain that many. Each investment card is +1x the score of that expedition, such that 1 expedition card doubles the score, 2 triples, 3 quadruples. This happens even when the score is negative. No cards and only investments is negative twenty points, but expeditions with no cards do not have a penalty. Overall, I look forward to many enjoyable rounds of this game. And I thought my MtG collection was worn out. For a while, this was *THE* game for my wife and I. We would break it out every night when the baby was asleep and play. Not just once. Not just twice. But several rounds. It may seem simple at first glance, but there is a lot more depth to the game when you play with people who can count cards (me) or people who have a strategy beyond “let’s just play all the cards I can” (my wife – she actually plans out her attack). You can look at your starting hand and you can play what equates to a game of solitaire, or you can engage with your opponent and bait-and-switch by using your discard power to force his or her hand. Because the game is so quick to both learn and play, it is also a “gateway” game that I often recommend to couples (along with the excellent Balloon Cup, also by Kosmos). A great couples game and a solid introduction to games for those who think all hobby gamers need to grow neckbeards and LARP. Simply stated, this game is fast, portable, easy to learn, and, most importantly, fun. It is a two player back and forth game that revolves around a rummy give and take format. For those of you who are a little savvier with the gaming terms, it’s a modification on a trick taking. I have noticed that this style of game is a cheap and easy way to build tension and play through wild gambles paying off or blowing up in your face. Before I get off into my actual run-down, I will WARN you all, my beloved readers, that this game takes more brains to score than it does to play (not cool, bro… not cool). So, the theme of the game is that you are on the hunt for lost cities. Each city is found at the end of a ten step journey. Each step of the way is represented by a number and each journey is represented by a different color. For example, if I go on the hunt for “Atlantis”, it will be done with the blue cards which number one through ten. There are five different colors/journeys you can go on. There are also backer/investor cards that can be played before the journey starts that will multiply your scores for good or for the bad. The more cards you play, and the higher those cards are, the better your score tends to be…. TENDS to be…. You will have your hand of 8 cards made up of random numbers and colors. During the turn you will put down a card and pick up a card. There are 5 discard piles, one of each color, and ten play piles, one of each color on each side of the player board (one set of play piles for you and one for your opponent). During the turn you will either play a card to your corresponding color’s play pile or the corresponding color’s discard pile. If the card is going onto a play pile, it must be a larger number than the card before it in the same color pile (if I have played a 4 as my last yellow card, my next yellow must be a 5 or higher). The investor/backer cards are played down before any number cards, and there can be up to three of them. After this, you draw a card from one of the discard piles or from the remaining un-dealt cards. You play until the last un-dealt card is picked up. That is how simple the game is! Scoring is done like this, and you do this for each color/journey individually then lump the sum: Take each journey/color you attempted, subtract twenty, add the numbers on the cards, and then multiply that by 2,3, or 4 depending on the number of backer/investor cards that were played down before the numbers (if you played one investor its x2, two investors x3, and three is x4). There it is…. complex, mathy, and ugly…. Ok, now back to the good, AND THE REASON FOR ALL THAT MATH. This game is fun because you have to think before you start dropping cards. Because each color you start will ultimately cost you twenty points, you want to know that you will make your points back. The big points come from those investor/backer multiplying bonuses, but you have to make sure you clear your investment cost or you will be multiplying negative numbers and digging yourself a hole. If you don’t think you will get your points back, then you want to discard the cards you are not using, BUT THEN YOUR OPPONENT MAY WANT EXACTLY WHAT YOU DONT AND THEN YOU ARE HELPING THEM, BUT YOUR HAND IS TOO FULL TO MAKE GOOD MOVES SO YOU CANOIANSOPINVAIOANGPOUNRADINCAIUN….. I think you get the idea. The seemingly overly complex math points system is what drives the game to be more than just a pick-up, put-down, trick-taking, rummy clone. It either rewards crazy gambles with blow-out style points or bone crushing debt. Even conservative players are forced to wait and watch for what the other player is going to do, in which wastes time and turns to put down point scoring cards. There is almost always a tough choice to make. This game is great. It’s not SUPER great, but it is a good one. If my wife and I don’t have the time to play something like dominion, then this can still give us some quality bonding. I LOVE games that my wife will sit down and play with me because she is not a gamer. The math, to me, is not hard to do in my head, but for her, a pre-school teacher, it is beyond her desire to perform when she isn’t at work. Put a calculator in the box and your golden. Now get out there and game friend! Sometimes you really just want to play a two-player game, but the majority of the board and card games on the market are tailored towards larger crowds. Enter Lost Cities, a two-player expedition game that pits you against another player in a race to explore uncharted areas. You will venture to places like the Himalayas, the Brazilian rain forest, deep inside a volcano, the depths of the ocean, and a scorching desert. 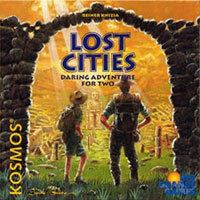 Come along as Reiner Knizia, along with Rio Grande Games, takes you for an unforgettable excursion into Lost Cities. Lost Cities is a very easy game to pick up. The game comes with a game board, 45 Expedition cards, 15 investment cards, and a rule booklet. The cards in the game are rather large which benefits the art style. 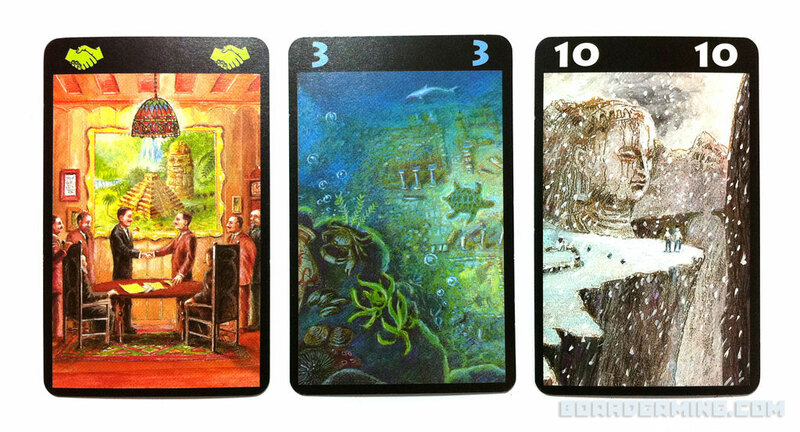 Each expedition card has a different picture on it, each with its own intricate depiction of where you are exploring. The goal of the game is to score more points than your opponent by playing cards in numerical order on each expedition. The way the game begins is that each player receives 8 cards and then begins an expedition. Cards are numbered 2-10 and allow you to go on one of five expeditions. Since there are several expeditions you can go on, there is rarely a game where you will end up playing on all five spaces. You can play your cards in any order, as long as they are numerical. You could potentially play a 2, 5, 8, and 10, but you need to realize that the more cards you play on an expedition, the more points you will receive. Players can also play investment cards, which adds to the amount of points you receive for each expedition. The only downside to investment cards is that you can only play them on an empty expedition, and can’t play one if you already have cards played in that area. If you play a single investment card, you will receive double the points. If you play two investment cards you will receive triple the points, and so on. On your turn you will play a card and then draw another card. You can play on an expedition or discard a card onto the top of the board in each section. The other player could then pick up a card from that expedition’s discard instead of from the draw pile. Players continue to play their cards and go on expeditions until the draw pile is empty. Once the draw pile is empty you tally up your face-up points for each expedition. Each expedition is totaled individually and then subtracted 20. If you have 25 total points in the Himalayas, then you would subtract 20 points and multiply it by the number of investment cards you had placed on that expedition plus one. Yes, you will need a pad and pencil for this game because it forces you to do math. If you failed to reach 20 points on an expedition then you still subtract 20 points, but then those points become negative points against you. What’s even worse is when you have an investment card on a negative section and have to double the points you lose. If you didn’t place any cards on an expedition it doesn’t go against you. Once all your points have been added up and combined you proceed to the next round. Three rounds is a good total number to play before you declare a victor, but it is up to you to determine that. The only gripe I had with the game was how hard it was to keep track of how many turns there were left. You are able to pick up the draw pile and count cards, but it seems like each round ends way too fast. If you have cards in your hand that you can play, don’t wait around for too long hoping for more points. Focus on breaking 20 points and you should be fine. Lost Cities is probably my favorite two-player game. It is easy to pick up, has some strategy to it, and can often get pretty intense. There were times where my wife and I would be playing it and wouldn’t be talking to each other at all because we were so focused on the game itself. Games go pretty fast and should only take you between 20-40 minutes. If you are looking for a great game for a spouse, significant other, or just something you can play with a friend, I highly recommend picking up Lost Cities. You never know what kind of treasures you will find along the way. Game on! Lost Cities is another of Reiner Knizia’s two-player only games. My edition is one of the Kosmos 2 player line. It has some similarities to Battle Line, as both games have players facing one another and placing cards in columns. The gameplay is easy and quick, and most anyone can grasp the rules in a couple of minutes. The endgame scoring can be a bit tedious, but not terribly so. The cards and a narrow board make up the components, and they are of good quality. But for some inexplicable reason, Lost Cities’ cards are oversized. It makes them more much difficult to shuffle than a standard deck. I find that card size matters. The small cards of Takenoko, Elder Sign, and Ticket to Ride are often criticized for their poor handling characteristics. Oversized cards are marginally better than the minis, but just a bit. Why not make them the size of regular playing cards? Gameplay is simple and straightforward, but it is not especially thematic. Players must choose from among five “expeditions” to fund. They may pick from five colored suits of cards, and play them in ascending order in columns marked by the play board set between the two players. On a player’s turn, he plays or discards one card and draws another. When the draw deck is exhausted, the game ends. Players then tally their scores. Each started expedition costs a player 20 points, so it is critical that the sum of a player’s cards total 21+ points. Otherwise, an expedition can result in a negative score. “Handshake” cards can be played as a multiplier for the point value of an expedition. But they must be played before any numerical cards are played. A player can multiply the subtotal (the value of the numerical cards minus 20) of his expedition times two, three, or four by playing one, two or three handshake cards. Using the handshake cards is a gamble, because negative scores also will be subject to the multiplier. A low scoring expedition with four handshake cards can result in a huge scoring deficit. 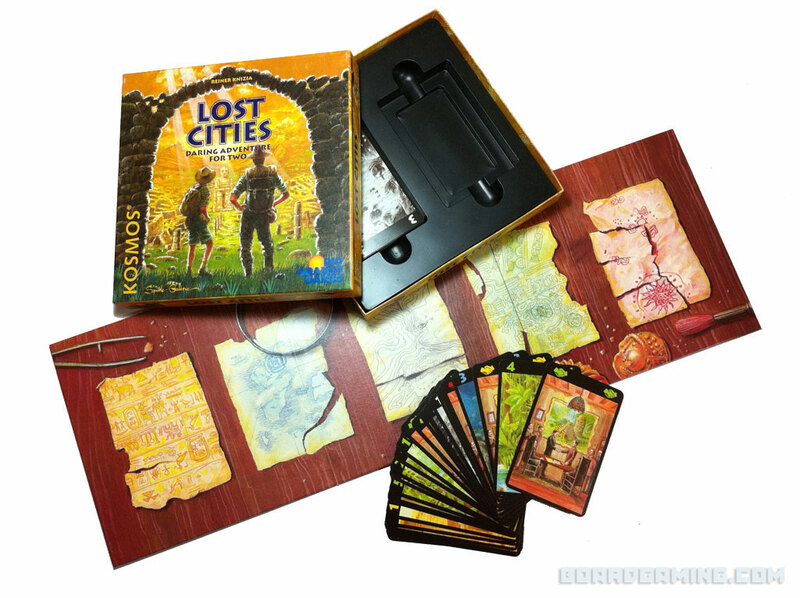 Lost Cities is a staple of introductory, two player games. It serves as a good filler game that is perfect when time is short. Players can play three rounds (a good number) in about 15-20 minutes. Setup is quick and easy, and most anyone can understand the rules of play. The game is inexpensive and occupies little shelf space. Along with Battle Line, Lost Cities is a light, fun card game for two from Reiner Knizia. This was one of my wife’s goto games with me, since I got the board gaming bug. I can’t count how many times we’ve played this. This is another Reiner Knizia classic game of press your luck and subtle give and take of cards. Each player goes on a “expedition” to find lost artifacts….nah, just try to build a stack of cards with the most points. The theme really has no meaning other than pretty artwork on cards. The trick is that you have to score over 20 points on each stack to make positive points (i.e. subtract 20 points). The person with the most points after three rounds wins. If you have bonus cards that can double, triple, or quadruple your stack the better, unless you’re in the negative… then it hurts! Very rarely can you start out with the 20 plus points in your hand for a stack (or suit), because you really have to build it as you go and hope another card you need comes along. It’s a game of give and take, because your opponent can discard cards to the center which you can pick up in lieu of a draw or vice-versa. The problem is that you don’t know what’s in the opponent’s hand and whether or not they need that card. You could potentially give them the game by giving them a card you can’t use, but you have to discard it because you’re hanging onto other cards you need to complete your stack of cards. This is where the game gets tense especially towards the end of the game. It’s not a deep game, just a tense one of do I pick the card or discard that card or do I hold out for a better card kind of game. Very enjoyable game overall, and the game plays very quickly! This is a mathematics/numbers game. There are 5 expeditions, each with 3 investment cards and 1 copy of each number between (and including) 2 and 10. Each turn you play a card either into one of your expeditions or onto the discard pile for that expedition. Then you draw a card, either from the draw pile or from one of the discard piles. When you play a card on your expedition the card you play must be of greater value than the one previously played. At the end of the game, as soon as the draw pile is empty, each player totals their expeditions, subtracting 20 points from each expedition they contributed to. The tension in the game comes from deciding when to start an expedition and which ones to abandon, as trying to play all of them will result in negative points for at least one. Players are making decisions based on the totals they can make, as well as deciding to give up a card their opponent might take in order to stall and hope for a better draw. It plays fast, but is rather light on strategy. It makes for a great filler or casual game. Lost Cities has a reputation as “the game your spouse will play,” and it’s well deserved. Spouses (both sexes) of gamers who are not big gamers themselves find this approachable, and it’s good for all ages. Components: The components, consisting of color cards and a small central, to be placed between the two players, are nice. The graphics help evoke the (light) theme of exploration. Play: Play consists of putting down a card (or discarding) and picking up a card. Each player in turn places down cards in one of five colored rows, placing down lower numbered cards first and going upwards (never downwards) from 2 through 10. Numbers can be skipped. At game-end, each row is totaled, and any points remaining after you subtract 20 go toward your winning total. If the row totals less than 20 (a row with a 4-6-8 would only total 18, for instance), the difference is subtracted from your victory point total. Special handshake cards, which can only be played at the start of a card line, can multiply loss/victory totals. It’s a simple game, but the end stage of the game can be filled with maddening decisions. Risk starting a 4th or even 5th row? Double down on a multiplier row? Even discarding can be tough (especially if you pull valuable 9 or 10 cards before you can play them), because your opponent can seize discards to complete their own competing rows. It’s a good, clean game that can be taught in 10 minutes, but falls nicely into that “easy to learn hard to master” category and often gives that “if I just had one more turn…” experience. Highly recommended if you need a simpler filler game. Lost Cities is a great, light, two-player card game with some strategy to punch it up. Like most Knizia games, the trick is to figure out when you want your pain and in how big a dose. You are always going to be forced to do something you don’t want to do whether it is play a card your opponent can use or play something sooner than you want. The fun part is watching your opponent go through the same agony. The goal is really just to play enough cards to get positive points more often than you play cards to get negative points. That’s right, you start in the hole on this one. But keeping ahead of the giant rolling boulder is most of the fun in this game. Also like most Knizia games, the theme is really an afterthought to the mechanisms. Still, the theme in Lost Cities actually feels like a part of the game if you have any sort of imagination due mostly to the beautiful art work on the cards (although I did feel like I was playing one of those Old Maid games with the giant cards). If you are on the lookout for a good game when there aren’t many gamers around, Lost Cities is a great bet. Lost Cities is obviously well-designed as a math game, but don’t let the “archeology theme” fool you. The pictures are fun, but you could play this with a deck of regular Hoyle cards just as easily. That’s not to say that it’s not enjoyable. My wife and I love to break this out every so often or take it on a trip. The small size and quick play makes it a perfect travel game. The game is also quick to learn. The only aspect that is even remotely complex is the scoring, and that’s easily summarized in the rules. I would definitely recommend this game and am glad I received it as a wedding gift (from another gamer who didn’t want to buy a spatula). Just be aware that it’s not a game you can “get lost” in the story. It’s fast, it’s easy to teach and learn, and it’s a lot of fun. There’s enough depth to the game to keep you interested for at least a few dozen plays, but not so much that a new player is doomed against an experienced player. Luck is a significant factor, no question, but playing each game as three separate rounds (as recommended in the rules) helps take care of this. It’s a great ‘couple’ game because you can play it after dinner and talk as you do so, since there’s no need to devote every neuron to the game situation. The cards and board are quite nice, and for the price it’s worth having as a filler/gateway type game. It’s not the best game you’ll ever play, but I believe its reputation as a modern classic is well-deserved. We took this game on a trip, without the board, and it worked just fine. It’s a fun themed card game that you can’t just play using face cards. Pros:Each game is fairly short, so you can play as many hands as you have time for. The strategy is challenging enough to hold your interest. Cons:It’s pretty easy to have a really bad hand that almost no amount of good strategy can overcome. Add a Review for "Lost Cities: The Card Game"